If there’s one thing the film industry knows how to do, it’s put on a good show. 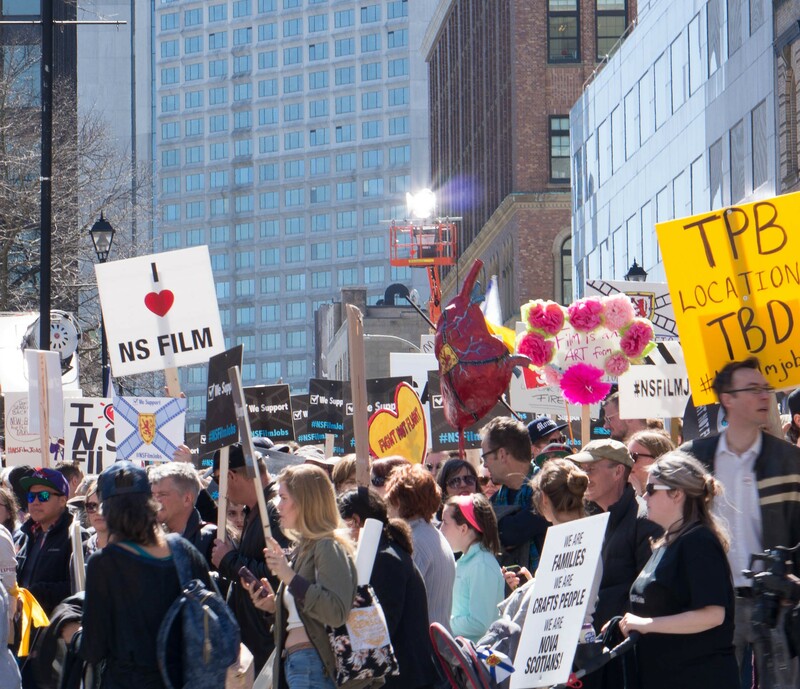 Yesterday, thousands of supporters surrounded Province House, while film industry types, from local celebs to costume designers took the stage to talk about the shrunken tax credit. In a matter of days, Screen Nova Scotia put together a pretty fancy-looking event, with a stage on Granville Street flanked by two giant screens, a live stream, and even porta potties. Between media coverage, smart phones and independent filmmakers capturing every second of the rally, the production value of the event was definitely worth a shitload of money. 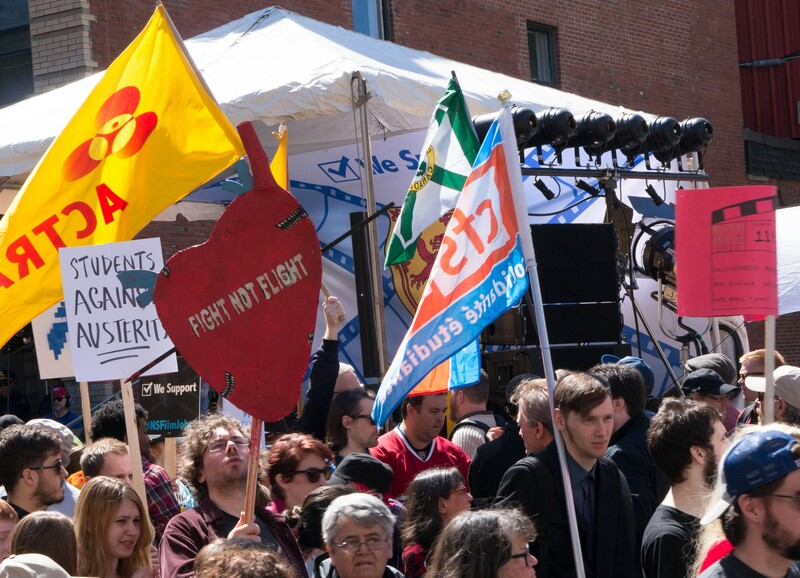 The rally, which officially began at noon, was well underway by 11:30am with drums beating and supporters marching the square block around the legislature. Jonathan Torrens emceed the event and kept the well-controlled ruckus going all day long. Mike Smith, Robb Wells and Patrick Roach from the Trailer Park Boys were some of the first to take the stage. They were emphatic about the importance of the tax credit and how the production of the show supports local businesses. “I can’t even wager how much was spent at the bars,” said Smith. Zealous signage and pops of bright yellow brightened up the already sunny day with ACTRA flags, crew shirts, balloons and babies with yellow headbands. Bubbles were floating through the air, and the smell of fresh popcorn wafted over Granville Street as thousands, young and old and costumed, attended the event. As advertised, it was a family friendly affair, with kids being pulled from school to support the industry, and students pressing pause on exam study to come out in droves wielding paper mâché bleeding hearts with quippy jabs at Premier McNeil. 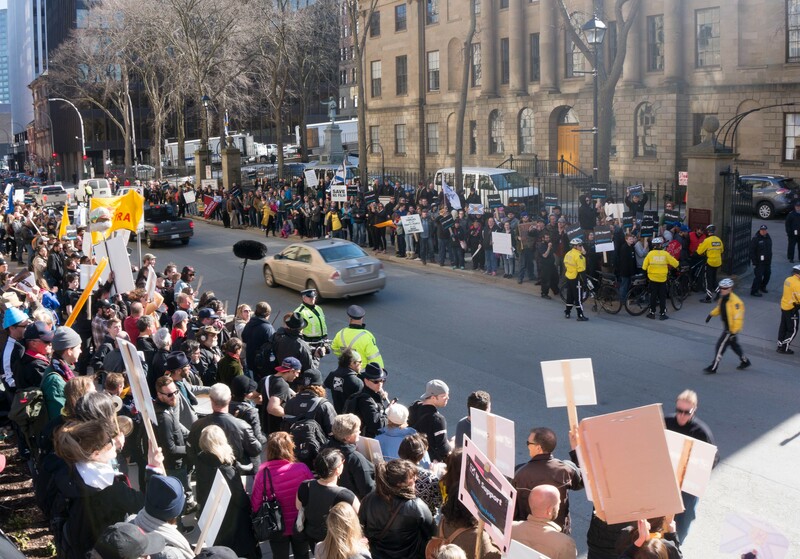 The noise was deafening at quitting time for the people inside Province House as supporters crowded the sidewalks of Hollis Street. With trumpets blaring and drums setting the beat for the chants, it was pretty clear the film industry has a lot more fight in them, even after six hours of impassioned demonstration.